In the 1943 article "The Russian Creoles of Alaska as a Marginal Group" Margaret Mary Wood published an account of Kodiak life. She writes, "The Kodiak area offers interesting material for a study of the influence of varying degrees of isolation upon the processes of racial diffusion and of cultural assimilation." Teaching at the Kodiak school for a quarter century Wood learns through experience about the "Creoles" in the archipelago whom she taught and lived among. These Native families, who referred to themselves as "Kreols," openly embraced their heritage with the Russian colonial era from 1741 to 1867. 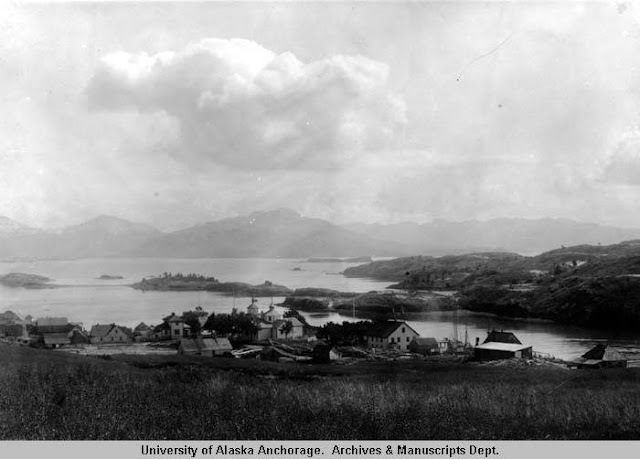 After that time the United States purchased the entirety of the "Russian American" estate that included the Kodiak area, the enormous mainland, and the multitude of islands that compose the Aleutian chain. While pitted as isolated in the article the cultures of Kodiak prove to be complex in their histories and in the moments of her observations. Kodiak. View of a group of school girls having a foot race. Their supporters line the road to cheer the girls on. The bodyof water in the back ground may be Chiniak Bay. Photo taken during National Geographic Society expedition on the way to Katmaiarea. 1915. UAA-hmc-0186-volume1-3554. Important for Wood proves to be tracing the "Native blood" of Creoles and other Native people living on Kodiak (like the "Kodiaks") whom she describes as "lost their identity" due to infusion of various types of people coming to the islands. I think her feelings about race and purity contribute to her view of Creoles as a vanquishing culture. 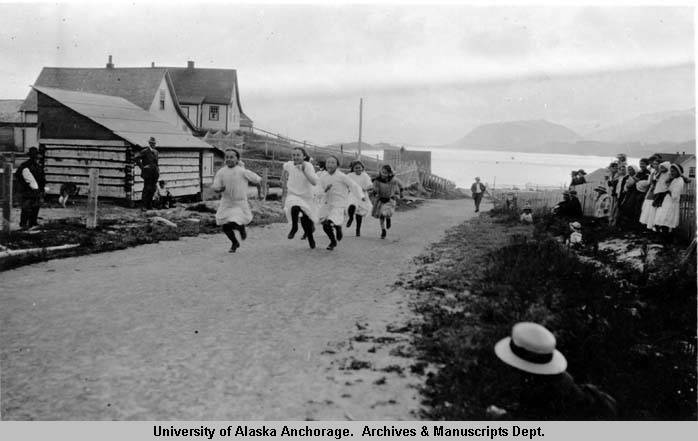 She writes, " Out of the 450 people in the village of Kodiak only 22, including 3 children, where pure blood whites and the number of pure blood natives was equally small." (206) Historian Patrica Seed has noted in Ceremonies of Possession that Northern European ideas on civility and savageness came to mark the landscapes and peoples of North America, in that the British colony represented the civil and the natural landscape with it's Native peoples was labeled savage.2 Holding on to the "blood" proved imperative for her Kodiak. For the Creoles that she studies exist without Western ideals of purity and are therefore at a deficit in the US cultural system of the time. In her line of thinking the rights they gained by admonishing their pure racial subjectivity amid Russian colonialism has lead to a their unease within the US colonial culture now on the islands. She is unable to recognize the Creole subjectivity as a mechanism emerged from the sadistic and cruel society of Russian America. Perhaps to do so would be to spot the author's own place with the US history on the islands? For the essay is to make the Creole the problem and the sacredness of the "egg" and the "seed" as the solution for the messiness of transcolonial Native cultures. At the end of the short piece Wood focuses in on the social lives of young Creoles whom compete with Whites for sexual relationships. She writes, "For the young creole men the competition of the white men coming into the community for the favor of the creole girls presents a problem. 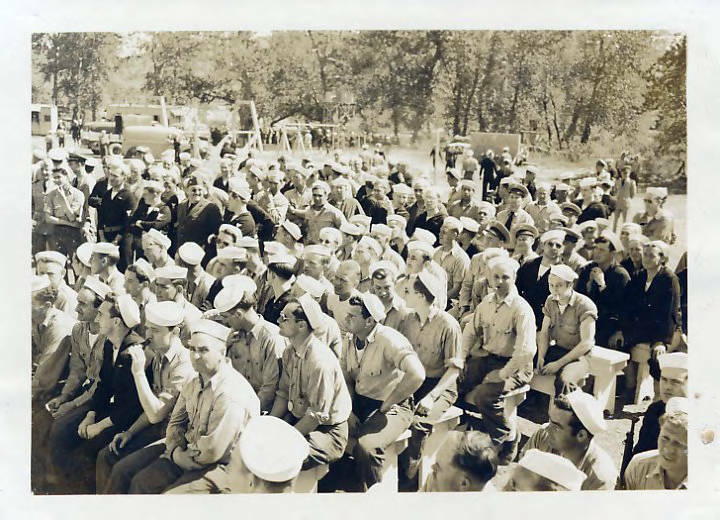 If many of the Kodiak girls marry into the white group, the creole men will have to look farther afield for their wives. It seems probable that this situation would result in their marrying girls from other more isolated villages in the Kodiak area where the proportion of native blood in the population is greater than it is at Kodiak." Because if White men (coming to the islands with the military for instance), in other words, marry Creole women would place a burden on Native culture because Creole men will be forced to look toward Native women for their relationship needs. In fact, she sees a problem that with the influx of White men on the island there have been countless children, born from Native women with White fathers, placed into orphanages. In her observations she the US project on the island as the problem. Where amid Russian occupation social groups came to be and were acknowledged while with the coming of the United States, with its racial culture, the Creole children of White men and Native women are cast aside. In the end the article argues that it is Kodiak's unisolated nature that is problem, not the racial ideologies that underwrite the article. 1. Formally, translated into English as "Creole," it holds a meaning distinct from how it is applied at the time as someone with an African and European ancestry. Also the cultural condition of Kreol misaligns with the Spanish term Criollo, translated into English as "Creole" as well because Criollo possesses an implication of a South Americans with only Spanish progenitors. One could think of the Kreoles are more situated with the cultural groups called "Mestizos," in part because they were of Native and Eurasian descent but publicly favored themselves as part of the colonial culture that occupied their homelands. As mentioned, during the Russian colonial period of this part of North America an individual would possess greater freedoms with the Russian controlled social and cultural atmosphere in Kodiak if they expressed and held proven ancestry that derived from European and Russian decent. 2. See the works of Nathaniel Hawthorne or Washington Irving.